It would be a grave mistake to assume that low-speed car accidents aren't dangerous. Even car crashes which occur at a speed of 25 mph or lower can be harmful. Some of the most common types of car accident injuries are back injuries. Back injury accidents occur because the spine is struck, bent, or stretched by the impact of a collision. Back injuries, unlike other types of trauma, may take a long time to make themselves apparent, and the complications which arise from them may last for years. If you or loved ones have been received back injuries in a car accident, you should get in touch with an experienced back injury attorney straightaway. The spine is a tube of bone, muscle, tendons, and nerves with three distinct regions: lumbar (lower back), thoracic (upper back), and cervical (neck). The spine serves several vital functions in the human body. First, the bones of the spine serve as the skeletal system's anchor: without the spine, most human movement (like bending or twisting) would be impossible, and human beings wouldn't be able to stand up straight. Attached to the vertebrae is the spinal cord, a thick cable of nerves which serves as the main highway between the brain and the rest of the body. Nerve impulses and commands travel along this highway, and if the connection is damaged or severed, sensation and movement may be impaired in the individual's arms, legs, and torso. On the flip side, intense pain may be the result of a spine injury. Thoracic injuries. High-speed accidents often cause damage to the thoracic vertebrae in the upper back. This is a serious injury, as the thoracic spine is connected to the ribs and chest. Fractured vertebrae or sprains in this vicinity of the back often cause long-lasting nerve damage. Lumbar injuries. Situated in the lower back, the lumbar region of the back consists of the five largest vertebrae and the strongest muscles. This is the back's strong foundation, propping up all the rest of the vertebrae. Sprains or fractures in the lumbar region can have dire consequences. Stretching or straining the lumbar area often causes intense pain, tenderness, and swelling, and often impairs a person in their daily activities. Herniated discs. 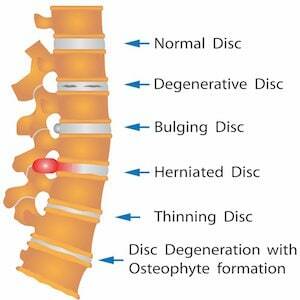 Discs are spongy cushions which are situated between vertebrae. If the back receives a strong enough jolt (say, the violent impact of a collision), these discs can be dislodged. A herniated disc is not only extremely painful (because it may press up against the nerves of the spinal column) but may also deaden sensation in the legs. Spinal cord injuries. While the spinal cord is, to some degree, shielded from injury by the protective sheath of muscle and bone which makes up the spine, it can still be hurt by a hard enough impact. Bruising, excess pressure exerted over time, or even the stretching or tearing of the nerve fibers themselves are some of the most common (and painful) types of spinal cord injuries, and may easily lead to a lifetime of disability or paralysis. The severity of a spinal injury may necessitate surgery, which puts the patient at risk for complications such as bleeding, clots, or bacterial infection. Whiplash. This is an injury which primarily affects the cervical part of the spine (the neck). In a collision, the head is often jerked forward and backward violently, straining, stretching, and even tearing the muscles, ligaments, and nerves of the upper spine. This can cause stiffness, soreness, a tingling feeling in the arms and legs, and headaches. Bone scans, myelograms, magnetic-resonance imaging (MRI), computerized tomography (CT) scans, and X-rays are all used to determine the extent and severity of back injuries. As advanced as medical science is, there are some back injuries (particularly those to the soft tissues) which are difficult to detect. Short-term treatments for back injuries include pain medication and anti-inflammatory drugs, chiropractic visits, and physical therapy. Grave injuries, as was stated earlier, may require surgery to correct. When vertebrae and discs are put out of place by violent impacts, they often exert pressure on the spinal cord or peripheral nerves. Vertebrae may need to be repositioned, or even surgically altered. Parts of the vertebrae or displaced discs may need to be removed. The Mayo Clinic reports that four out of ten back injuries were the result of motor vehicle accidents. Violent impacts frequently cause damage to the necks, backs, and heads of victims. The to-and-fro motion of a sudden stop, and the jarring blow of blunt force trauma are unnatural, and the human body was not built to withstand them. Even low-speed impacts can deal long-lasting and drastic damage to the back and spinal cord. Pain, limited mobility, and even partial paralysis are all possible outcomes. If you've received minor, moderate, or serious harm due to a back injury accident, then you'll probably need to see a series of medical specialists to receive treatment. This is expensive and time-consuming. You may lose wages due to missing work or be put into a financially untenable position. Don't let this happen to you. You shouldn't be liable for the damage someone else's negligence caused. The Reeves Law Firm is experienced with back injury accidents just like yours. We specialize in obtaining fair compensation for accident victims in Decatur, Huntsville along with the rest of Alabama and Tennessee. Call us today at 256-355-3311 for a free consultation.